The Seychelles is one of the world’s most dynamic and fastest growing offshore jurisdictions offering clients a tax-efficient base for their operations. The International Business Companies Act, 2016, governs the operations of offshore companies. The registration process in Seychelles is straightforward. 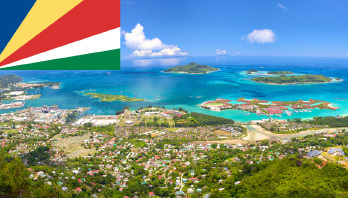 All our offices can provide services relating to Seychelles via our Seychelles office. The Seychelles has a population of around 90,000, descended primarily from French settlers, Africans, British sailors and traders from India, China and the Middle East. Discovery of the Islands is credited to the Portuguese explorer Vasco de Gama. The first French settlement was established on St. Anne Island on the 27th August 1770. In 1814 the Seychelles, along with Mauritius, were ceded to Great Britain under the terms of the Treaty of Paris. It was only in 1960 that the first gradual constitutional reforms were introduced. The Head of State is the President and a National Assembly of directly elected Members heads the legislative side of Government. Seychelles is an independent republic within the British Commonwealth. The Seychelles economy is primarily tourism and fishing based. Industrial fishing is on the increase. The rapidly expanding financial sector, linked to the establishment of the Seychelles International Business Authority and a suite of progressive laws facilitating the establishment of offshore structures and encouraging inward investment, is now a significant element of the economy. An ever-increasing number of international banks and insurance companies have established either branches or subsidiaries whom, together with local management, accounting and legal firms provide clients with support. The Port of Victoria is well equipped with modern cargo handling equipment and has more than 6,000 square metres of covered storage space. There is no exchange controls in the Seychelles. The International Business Companies Act 2016. Seychelles International Business Companies are useful alternatives to offshore companies established in jurisdictions such as the British Virgin Islands. In December 1994 the Seychelles enacted legislation enabling the registration of International Business Companies, International Trusts and the licensing of International (free) Trade Zone Companies. More recent legislation covers the licensing of offshore banks, offshore Insurance, mutual funds activities and the regulating of a securities industry. The new laws were a result of intensive studies of long established offshore jurisdictions and world-wide trust legislation. Although not dissimilar to those of the well-established offshore jurisdictions such as the Cayman, the laws take a most comprehensive, modern and attractive approach to the establishment and operation of offshore companies, mutual funds, offshore banking, offshore insurance and freeport activities. Seychelles is one of the fastest IBC registrar in the world. The International Business Companies Act, 1994, governs the operations of offshore companies. The registration process in Seychelles is straightforward. Prior approval of the company name is required. Application by the ICSP to the Registrar to incorporate the company in the approved format and providing the required information. The Registrar will issue a unique company registration number. Within 3 working days of the issuance of the company registration number by the registrar, the ICSP shall submit at least 3 copies of the company’s Memorandum and Articles Association to the Registrar who shall incorporate the company and issue its Certificate of Incorporation. Carry on gambling business (as defined in the Seychelles Gambling Act), including interactive gambling business in Seychelles; or outside Seychelles unless it is licensed or otherwise legally able to do so under the laws of each country outside Seychelles in which it carries on such business. English or French. If any other language is used it must be accompanied by a translation in either English or French. Yes, must be maintained in the Seychelles and shall be the same address as that of its registered agent. Must end with the word “Limited”, “Corporation”, or “Incorporated”, or abbreviation “Ltd”, “Corp”. or “Inc”. The name of a protected cell company shall end with the words “Protected Cell Company” or with the abbreviation “PCC”. Anything identical or similar to a company already incorporated. Anything that suggest or is calculated to suggest the patronage of the Government of Seychelles, or any other government. Should not include a prohibited word, phrase or abbreviation referred to in Part 1 of the Third Schedule or Part 11 of the Third Schedule of the Act. The name of the company may be expressed in any language, but must be accompanied by a translation in English or French; and where the name of a company is in the English or French language, it may have an additional foreign character name. The documentation will either be in English, or it is possible to have bilingual documentation in English and Chinese or any other language accompanies by a translation in English or French. Must end with the word “Limited”, “Corporation”, or “Incorporated”, or abbreviation “Ltd”, “Corp”, or “Inc”. The name of a protected cell company shall end with the words “Protected Cell Company” or with the abbreviation “PCC”. No. Requirement to keep a Registered of Beneficial Owners at its registered office in Seychelles. Seychelles IBCs can be incorporated with an authorised share capital of US$ 1 or any amount. A company may issue more than one class of shares; may be redeemable, confer no rights, or preferential rights to distribution; confer special, limited or conditional rights, including voting rights; confer no voting rights; participate only in certain assets of the company; be convertible to another class or series. May issue a class of shares in one or more series. May be issued as a par value share or a no par value share. Shall not have share capital consisting of shares which include par value and no par value shares. Par Value Shares may be expressed in any currency. May issue fractional share. Bearer Shares are prohibited. Annual Licence Fee is Annual licence fee of US$ 100 irrespective of Share Capital. A company shall keep reliable accounting records that are sufficient to show and explain the company’s transactions, enable the financial position of the company to be determined with reasonable accuracy at any time and allow for accounts of the company to be prepared. The accounting records shall be kept at the registered office in Seychelles or such other places as the directors think fit. The company must inform the registered agent of the physical address at which the accounting records are kept where the accounting records are not kept at the registered office. The most attractive feature of the Special License Company is its ability to bypass foreign blacklisting by being a low-tax company (as opposed to a zero-tax company, like IBC). A CSL is also able to access and use the growing number of double tax avoidance treaties concluded by Seychelles. These treaty benefits are not accessible to IBCs. Unlike an IBC, a CSL is formally considered tax-resident in Seychelles, which in turn allows for easier conduct of its business abroad, attracting less suspicion and scrutiny. Permitted currencies Any except Rs. A certificate signed by a legal practitioner in Seychelles to the effect that the memorandum and articles of the company with the Companies Act 1972 read with the Companies (special Licences) Act 2003. Names and addresses of shareholders and where any such shareholder is a nominee, the name and address of the person on whose behalf the shares are held by the nominee. The memorandum and articles of association duly signed and dated. A description of each business the company proposes to engage in. The name reservation certificate, if any has been issued. If Authority approves 3, 4 and 5 are forwarded to the registrar of domestic companies who will register the memorandum and articles of and issue Certificate of Incorporation under the Companies Act, 1972. FSA then issues a Special Licence to the company to carry on its business. At least 1 month (including licensing). Anything identical or similar to a company already incorporated. Anything that implies patronage of the Seychelles, or any other government, royal, imperial or any other name that may imply that a company intends to undertake an undesirable activity. The name can be in any language, but must be accompanied by a translation in English or French. The documentation will normally be in English. Normally denoted by Limited in the case of a public company or Proprietary Limited in the case of a private company. Information regarding beneficial ownership is disclosed only to FSA. Normally Seychelles Rupees 25,000 (approx. US$ 5,000). CSL is taxed at a rate of 1.5% on its worldwide income. Company needs to submit only to FSA annual returns and documents related to the accounts not more than 90 days after the end of each financial year of the company. After completing the documents required for a Trust, a declaration by the Trustees is to be made to the authorities confirming that the settlor is not resident of the Seychelles, the Trust property does not include immoveable property situated in the Seychelles and the Trust qualifies as an International Trust. Yes, must be licensed in the Seychelles. The assets of the trust can be anything other than a property situated in the Seychelles or any shares, debentures, or any interests in any body incorporated under the law of a country other than Seychelles or an International Business Company or another International Trust. An International Trust is exempted from local taxation subject to the above. There is no requirement to file financial statements, but a trust must keep records to reflect its financial position. The minimum number of Trustees is one, and must be a licensed Trustee in the Seychelles. An identifiable and ascertainable beneficiary has to be defined on creation of a trust. However beneficiaries can be added and excluded at any time by the Trustees. A settlor or trustee may also be a beneficiary but shall not at any time be the sole beneficiary of the Trust.